In SWF Easy you can set an element as background of a scene. Whatever you draw, whatever image you import to canvas and whatever shape you select from Resource can all be set as background. You only need to make sure the background you set is one element. If you want to set several elements as background, you should group them as one element first. When you want to set an element as background, select the element and right click it to choose Set As Background in the context-sensitive menu. Then it appears a dialog for you to select background position. Select any position you want and then the background is set. Once you have set an element as background, it cannot be selected or edited unless you change background. Right click to select Change Background and choose Empty, Restore or Position to achieve changing work. Empty means you change the background to be empty. Once you select it, the original background will disappear. Restore means you restore the background to be the original element, including its original position. Position means you re-position the background. 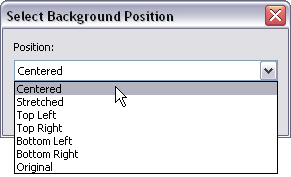 Once you select it, the Select Background Position will appear again.